Exponentially Distributed Measurements are data that follows the inverse of the Poisson distribution, and are sometimes referred to as the Poisson Process. Many measurements follows the exponential distribution, but the two most common types are time to event and ratios. As time to event is both intuitively easy to understand, and the most common type of data used in quality control, this page will use time to event as example and to explain CUSUM for this type of data. Time to event is the reverse of events per unit of time. λ events per time unit is translated to an average of β = 1/λ time units between events. Examples of time to event measurements are the time interval between successive , patient falls in an old age care facility, time to burn out in light bulbs, time required to run or swim a set distance, or , time interval between soldiers being accidentally kicked to death by horses in Napoleon's army. Exponentially distributed measurements, such as time, can sometimes be treated as normally distributed measurements. This is particularly so when the range of the data is narrow, and the central tendency is far away from the basic value of 1., An example is maternal age, usually with a range of 20-35 years, and is usually handled statistically as a normally distributed measurement. However, neonatal age, with ranges from 1 to 30 days, has to be handled as an exponentially distributed measurement. A common model for CUSUM is that in the CUSUM and Shewhart Charts for Poisson Distributed Counts Explained Page, counts in a defined environment over a defined period of time. Examples are the number of complaints per month in a hospital, the number of falls in a aged care facility per week, the number of adverse events in a surgical unit per year. The disadvantage of using Poisson counts is that no information is available until the end of the defined period, when the number of events are compared with the expected number. The use of the exponentially Distributed measurements overcome this disadvantage. The measurements are the number of hours between complaints, the number of days between falls or adverse events. Decision points are whenever an event occurs rather than after a pre-determined period of time. The symbol beta (β) is usually used to represent time to event. The in control measurement is usually represented by β0, and the out of control measurement a particular CUSUM is designed to detect is represented by β1. All calculations are based on the ratio to the measurement in control, regardless of whether the measurement is in seconds, minutes or hours. CUSUM therefore use the value 1 for in control, and all time measurements are ratio of measurement / β0. , Exponential distribution is asymmetrical, with a longer tail at higher values. Calculations for ANOS and h values are therefore complex. The amount of memory requirements and the size of numbers required increases exponentially at extreme values, and the computer program needs to be adjusted to cope with this. The results from calculations in StatsToDo, presented in the CUSUM for Exponentially Distributed Measurements Program Page have been checked against the charts produced by Gan (see references) and they seem correct. However rounding errors increase in the program for β values less than 0.02, and for the lower ANOS values when β values are very high. h values for β between 0.99 and 1.01 have not been published, so have not been tested, and ion any case these are unlikely values in quality control. We will use the default example in the CUSUM for Exponentially Distributed Measurements Program Page as an example. The data was computer generated to demonstrate the methodology and is not real. We are monitoring the quality of light bulbs produced from our factory, and we sample them regularly, and test how many hours of use before a light bulb burns out. We expect the standard when everything is in control to average 200 hours of life (β0 = 200), and we would consider that a reduction to 125 hours (β1 = 125) to represent the out of control situation. In other words, we want to know when the life of our light bulbs is reduced to 62.5% of that expected (β = β1/β0 = 125/200 = 0.625). The common convention is to nominate a decision interval (h) that will provide the in and out of control ANOS that suits the user. The alternative, used in these pages, is to nominate the in control ANOS, calculate the decision interval, , then calculate the out of control ANOS of that decision interval. Also, given the bio-medical background of this web site , (even though the example is about light bulbs), 3 different alert levels are provided. Yellow alert (take notice but no action). ANOS nominated (averaged number of events before a false alert) = 50, decision value (h) = -2.78, and an alarm will be raised at an average of 14 events after the situation becomes out of control. In the default example data is as follows. 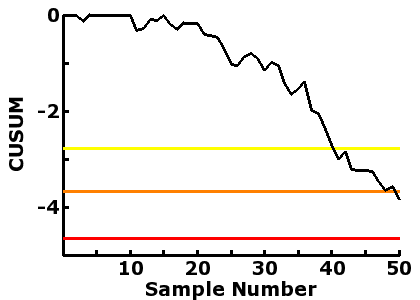 From the 11th sample onwards, consistent lower values resulted in progressive decline of the CUSUM values, until the 41stsample when it crossed the yellow alert line, and at the 50th sample when it crossed the orange alert line. Similar to Example 1, the data here is computer generated to demonstrate the calculations and does not reflect any reality. We are running an airline, and wish to maintain efficiency in aircraft turn-around time, between landing to take off. We expect the standard when everything is in control is an average turn-around time of 120 minutes , (β0 = 120), and we would consider that an increase to 180 minutes (β1 = 180) , to represent the out of control situation. In other words, we want to know when the average turn-around time increased , to 1.5 times that expected (β = β1/β0 = 180/120 = 1.5). Yellow alert. ANOS nominated (averaged false positive rate) = 50 flights, decision value (h) = 3.95, and an alarm will be raised at average of 12 flights after the situation ,,becomes out of control. The data , the number of hours in turn-around time in successive flights, is as follows. 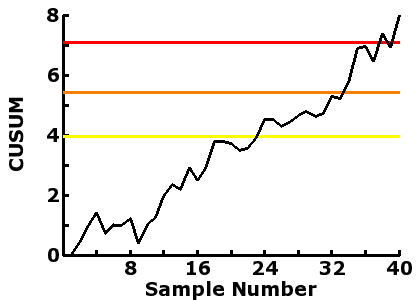 The computer generated the first 10 values with average of 158, and the remaining 30 with average of 174. From the 11th flight onwards, consistent longer turn-around times resulted in progressive increase of the CUSUM values, until the 24thflight when it crossed the yellow alert line, and at the 34th flight when it crossed the orange alert line, and at the 38th flight when it crossed the red alert line.